From the Supreme Court of America to the smaller council chambers across rural England, the issues regarding the creation of shared or ‘gender neutral’ washroom facilities for public use have proved to be a legal as well as a political ‘hot potato’; and the debate is certain to carry on for the foreseeable future. For architects and interior designers, however, there are many other technical considerations, which must be respected if their work is to be regarded as a success for all potential users. For instance, it is essential that the background structure and substrates to the room are fit for purpose and able to offer such attributes as strength, durability and resistance to moisture. Other requirements including thermal or acoustic performance and the need to provide access for the less able-bodied – all addressed by Approved Documents to the Building Regulations. Ever since the emergence of the Egan Report, offsite construction, or prefabrication, has been gathering momentum across most of the sectors, with fully fitted bathroom pods playing a pivotal role in the delivery of different developments from student accommodation to hospitals, hotels and commercial buildings. 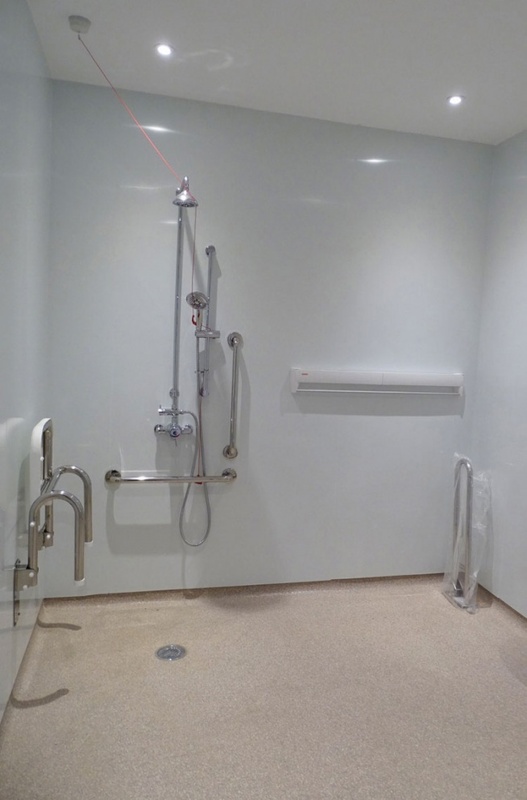 Whatever the scale, from an individual ensuite to a large washroom with multiple facilities, they enable a major part of the building services work to be completed offsite, speeding progress and improving quality. Though some pods feature reinforced concrete bases, the weight penalty sees the majority assembled using a light gauge steel or engineered timber frame, with a variety of board products providing the substrate for fittings and finishes. Despite using concealed steel frames with sizeable securing bolts, the ‘wall hung’ toilet bowls and urinals normally transmit a proportion of their load to the wall itself. So, whether the specifier selects a decorative laminate or a tile-backer board, they will have to be fixed over a 15 mm or thicker layer of plywood to prevent flexing. 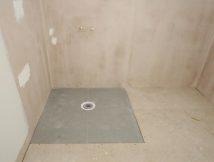 These tile-backer boards do, however, offer very good compressive strength, as well as a number of other positive physical characteristics, making them a popular choice for building either in-situ or offsite. Employed in wall or floor build-ups, they can sustain a distributed load of 40 tonnes per square metre, making them fully able to support the weight of pedestrians, wheelchairs and even mobility scooters when covered by appropriate floor tiles. This performance stems from their extruded polystyrene core, bonded between two layers of glass-fibre reinforced polymer concrete. This combination of a rigid outer shell and XPS core will allow it to serve as an effective decoupling layer. Importantly, this structure not only earns and ODP score of Zero and a Class O rating for flammability under BS EN 476, but the XPS also delivers excellent thermal characteristics. The insulation offers a thermal conductivity of 0.034 W/mK, and with the tile-backer board being available in thicknesses of up to 60 mm, they can make a significant contribution to achieving Part L requirements, reducing heat loss and combating condensation. In fact, high performance tile-backer boards are regularly employed on social housing sector contracts, where kitchen and bathroom renovations have to be completed to a very tight timescale, with the residents still in occupation. They can be screw-fixed over block and brickwork, or bonded using a cement based adhesive across uneven substrates; including existing ceramic tiles. 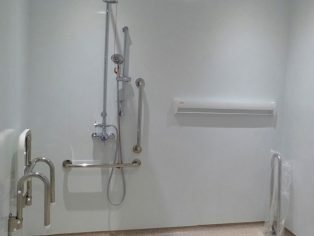 Given the UK’s humid temperate climate and the increasingly exacting design aspirations of developers and specifiers, choosing the right materials for the construction of bathrooms or other washroom facilities is paramount. With the endorsement of the Energy Saving Trust, CE marking and all other necessary accreditations XPS based tile-backer boards make a powerful argument for inclusion.